My favourite non-profit organization ever--the Mount Pleasant Family Centre--will be holding our annual fundraiser next month. 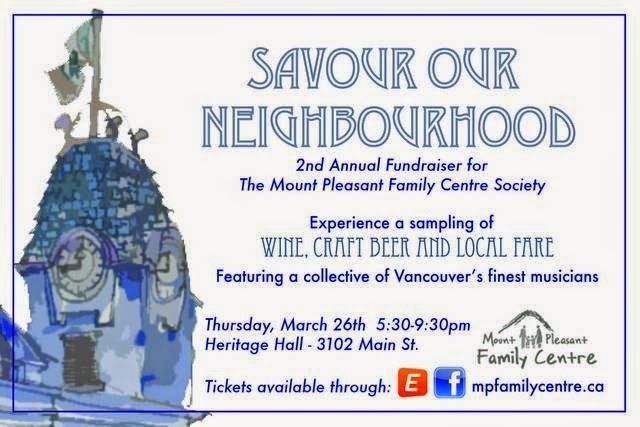 Savour Our Neighbourhood is an evening of wine & beer, great local food tasting, live music, & prizes at Heritage Hall. Tickets include food & a free drink, with proceeds funding the amazing work that the MPFC does in supporting families of young children in our neighbourhood. Last year's Savour Our Neighbourhood was a blast & it sold out well before the event, so I wouldn't wait on buying your tickets. Also: if you purchase your tickets before March 6, you can use the promo code SAVOUR2015 to save $5 off each ticket. Buy tickets here.